Is CC Sabathia’s arm falling off? CC Sabathia has been on a tear since joining the Brewers just before the All-Star break. Okay, you knew that already. Brewers manager Ned Yost has worked Sabathia hard with a 130-pitch game, two other games over 120 pitches and all but two games over 100 pitches in a Brewers uniform. This has shot Sabathia up the list of most abused pitchers and he recently overtook Tim Lincecum(!) for the top spot. Okay, so you likely knew this as well. This has prompted a lot of discussion, and some poking fun at Yost. The real question is what, if anything is this workload doing to Sabathia’s arm? Back in 2002, Keith Woolner tackled the issue and found that starters who were worked heavily lost effectiveness and had an increased chance of injury. While this was groundbreaking work, right from the start it was clear that there was more to the story. The two pitchers who were by far the most abused in 2002 were Livan Hernandez and Randy Johnson who, ironically, are still pitching today even at an advanced age. So while an obvious trend appeared—abuse your starters and they will get hurt—there were glaring exceptions of pitchers who were absolutely tortured according to the numbers but came out unscathed. One of my long-term hopes is that with PITCHf/x data we eventually will be able to help refine this study. For now, though, I want to focus in on Sabathia to try to determine what impact this heavy workload is having on him. First, let’s take a look at Sabathia’s stuff to find a baseline from which to compare. CC Sabathia is an absolute dream for a guy who studies PITCHf/x data. He throws three pitches, all of which are completely separated and easy to identify. Here is a look at his movement chart. Sabathia’s fastball is a shade over 95 mph with good horizontal movement into a left-handed batter and average vertical movement. That alone would make him a solid pitcher, but he also has a nasty slider that has huge horizontal movement in to a right-handed batter and has almost no vertical movement compared to a ball thrown without spin. This means the pitch appears to fall off the table both down and away from a left-handed batter. This is and why you see teams stack their lineups with right-handed batters aagainst him. If you have watched Sabathia pitch recently, you might have heard the announcers call this pitch a cutter because that is what Sabathia himself calls it. Normally, when a pitcher calls a pitch that my algorithm thinks is a slider a cutter, I will respect that and relabel the pitch when I write these articles. Here, I am digging in my heels and am going to call this pitch a slider. No cutters have a 13 mph difference in speed compared to the fastball and no cutters have so much horizontal movement and so little vertical movement. This pitch is a slider, and a slurvy one at that—so much so that sometimes you hear people mention that Sabathia also throws a curveball along with his slider. This is also not true. You can see from the movement chart there is just one cluster there. That said, sometimes Sabathia’s slider does have less horizontal movement and more vertical drop than usual and then the pitch can appear to be a curve rather than a slider, but when you look at all of his pitches it is clear that these really are the same type of pitch. Sabathia also throws a change-up to right-handed batters that has a decent 8 mph difference from his fastball and tails down and away compared to his fastball. While this is Sabathia’s third-best pitch, he is willing to throw it on any count and can throw it for strikes if he wants to. It doesn’t get the same swings and misses his slider gets, so he prefers the slider as his strikeout pitch, but he throws almost 30 percent change-ups to right handed batters, so he mixes that pitch in very well. I suspect that if Sabathia’s fastball and slider weren’t quite as dominant, his change-up would get more respect. Despite being a good pitch, it isn’t in the same ballpark as his other two pitches. This isn’t the first year that people have worried about CC Sabathia’s left arm. In 2007, he shattered his previous high in innings pitched, throwing 241 innings before the playoffs even started and breaking the 30-inning rule. So what kind of effect did this have on Sabathia? Unfortunately, PITCHf/x coverage was spotty at best in the AL Central for 2007 but it did pick up at the end of the yea,r which is really the part we care about most. So here are some wear patterns for Sabathia for 2007, starting with the fastball. This wear pattern combines movement and speed of a pitch as the year goes on. The black dots are the speed and they correspond to the left axis in mph. The red and blue dots represent the horizontal and vertical movement of the pitch and they correspond to the axis on the right in mph. The x axis is in days of the year and you can match things up by looking at his game log for 2007. Working backward, his last five starts all had PITCHf/x working, with his start at home against the Twins missing but his start at the Metrodome before that the system was functioning. The error bars represent the spread in his pitches that day so large error bars on the black dots would mean a large variation in fastball speed for that start. While there was some bouncing around in the movement, Sabathia’s velocity was incredibly consistent, not only game to game but in-game as well. Sabathia clearly can pace himself while still throwing 95 mph so he isn’t worn out at the end of the game. What about that nasty slider of his? Again, some bouncing around with the movement, but rather consistent velocity-wise. Because the 2007 data were sparse, especially for AL Central teams, they’re far less reliable than the corrections applied to the 2008 data when the camera systems were in every park from the beginning of the season. Still, if Sabathia was wearing down near the end of the season it doesn’t seem to be visible in these plots. What about his heavy workload from 2008? First notice again how stable Sabathia has been throughout the year. He always is around 95 mph with his heater and his movement has been mostly steady, though again we can see some bumps. Here is a link to Sabathia’s game log for 2008. Every start this time has been recorded by PITCHf/x. 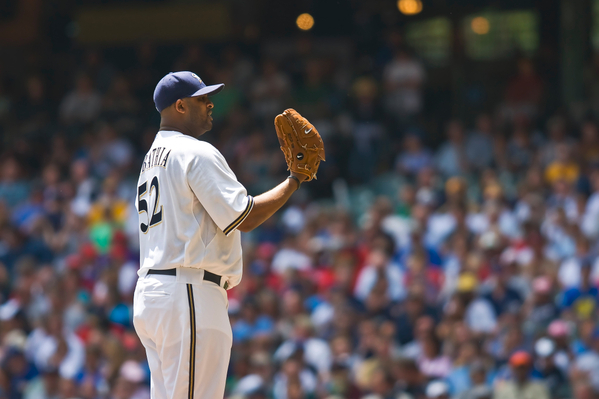 Sabathia’s first start for the Brewers came on day 189. His really high-pitch-count games came on July 13 (day 194), when he threw 122 pitches against the Reds, July 28 (day 209), throwing 124 against the Cubs, and Aug. 18 (day 230) throwing 130 against the Astros. Notice that the start after the first two high-pitch-count-starts Sabathia’s velocity was down just a smidgen, though he quickly bounced back in the start after that. His velocity didn’t appear to drop after the 130-pitch outing against the Astros, but the following game he had his shortest start as a Brewer, going only six innings and 96 pitches. Sabathia’s slider has been exceptional since he joined the Brewers. Notice that recently he has been throwing this pitch a little softer than usual, but he generally has been getting huge horizontal movement with it. Sabathia’s slider is one of the game’s best pitches when he gets five inches of horizontal movement, but when he is getting eight or nine inches of movement that pitch simply becomes unfair. If it takes slowing it down to 80 mph to get that movement, then that is exactly what Sabathia should do. It doesn’t appear that Sabathia’s slider has seen any ill effects from his long outings like the hints we saw with his fastball. This is the pitch to watch going forward. If Sabathia’s slider continues to be this good, he might be unhittable (well maybe one-hittable). In 2007, CC Sabathia threw many more innings than he had previously and didn’t appear to suffer down the stretch. So far in 2008, Sabathia not only has thrown a good many innings but has had several high pitch counts as a member of the Brewers. While there might be a hint at a short-term drop in velocity after a very high-pitch-count game, Sabathia has quickly recovered after that. The Brewers have been playing rather poorly lately and probably will be leaning on Sabathia hard to make the playoffs. While I am not saying that Yost should let Sabathia throw 130 pitches every time out, there it does appear that Sabathia’s stuff doesn’t take too big a hit when he does. If I am a GM trying to woo Sabathia in the of season, these large pitch counts would not bother me much. Sabathia has had no arm injuries and it appears that if used reasonably he can be a horse who carries a team on the days he pitches.